RedLynx is making a move to the Wii with a game much cuter than Trials HD. Finnish studio RedLynx's last big hit was August 2009's Trials HD on Xbox Live Arcade, which went on to sell 300,000 copies in a month. The developer is following Trials HD, which cast players as a dirt bike stunt driver, with another extreme machines-themed title called Motoheroz. Don't expect the grit and exhaust fumes you got comfortable with in Trials HD though, because Motoheroz has brighter visuals and a cuter feel. The sometimes soul-crushing difficulty of Trials, partially thanks to the game's robust physics engine, has been loosened up and the game is more about racing and exploration. Physics are still present in Motoheroz, but they're simpler. Players can either take on the single player adventure mode (in which coins and secrets can be found), a multiplayer racing mode with up to four players, or a daily race that players can compete in for the top spots on the online leaderboards. It basically looks like Trials combined with Excitebike. Though the description sounds simple, Motoheroz will boast more than 100 tracks, with four different vehicles to jump in. RedLynx really found an audience on XBLA with Trials HD, but it's worth a shot to try to get some of that Wii money too I suppose. The studio says Motoheroz will be released on WiiWare in late 2010 or early 2011.
loved trials can't wait for the next track set. This doesn't float my boat, and then the fact i don't own a wii sprung me a major leak. Ugly as in Realistic is Trials HD. 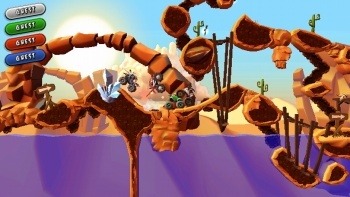 I do have to admit, that screenshot makes it look like a bad Worms clone. However, RedLynx have a good track record, and I can't see why this should be different.